Stressed? Relax, There’s Time For Everything! It’s that time of year again…how are you doing? Running around like a crazy person shopping, cooking, making appearances at events, going to parties, AND working full time. It’s enough to make you want to give up on this whole Christmas thing. Research says if you relax you will get more done…really! At first it seems counter intuitive, but it’s not. Making time to workout, spending quality time building relationships with co-workers, making the effort to eat healthy, and yes, getting more sleep gives you the energy to get more done, and do it better. And that’s what we need this time of year, more energy to get more done! The idea is that a task will grow and shrink depending on the amount of time you give it. And we are more productive and do our best work when we have shortened deadlines that force us to focus intensely on the task’s completion. Think of a time when you procrastinated on a task. Yet, at the 11th hour, you hunkered down, got organized, pulled out all your resources, and not only got it done, but did a great job! This experience is not uncommon. Rather than think of it as a fluke or a stroke of great luck, embrace this style of working, using Parkinson’s Law of Time to boost your productivity, increase your work performance, and improve your health by finding better balance and sleeping more! 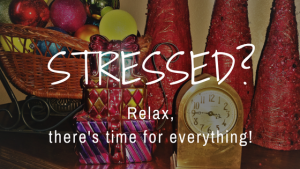 It may be the busiest time of the year, but you can focus and make time for everything! If you like this post, sign up for my Learning Community by clicking here.